Our Green Home helps Ontario residents make more sustainable choices in managing and improving their homes. Between March 24th and April 17th 2016, 250,000 copies were distributed in the Toronto Star, Ottawa Citizen and Globe and Mail. 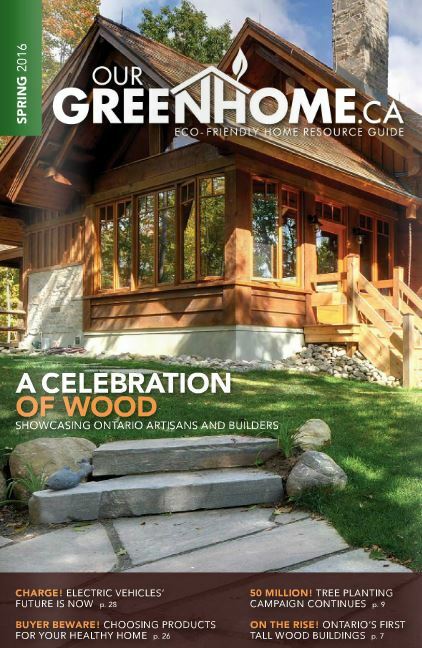 A central 16-page feature presented highlights of the work of participants in the Ministry of Natural Resources & Forestry’s Ontario Wood program, accompanied by updates on the Passive House movement, tree-planting programs, the expanded role of wood under new Ontario building codes, EVs, invisible home heath hazards, and an innovative new approach to urban wood waste in the GTA.